organizations to identify, analyze, and address social and political problems. democracy. 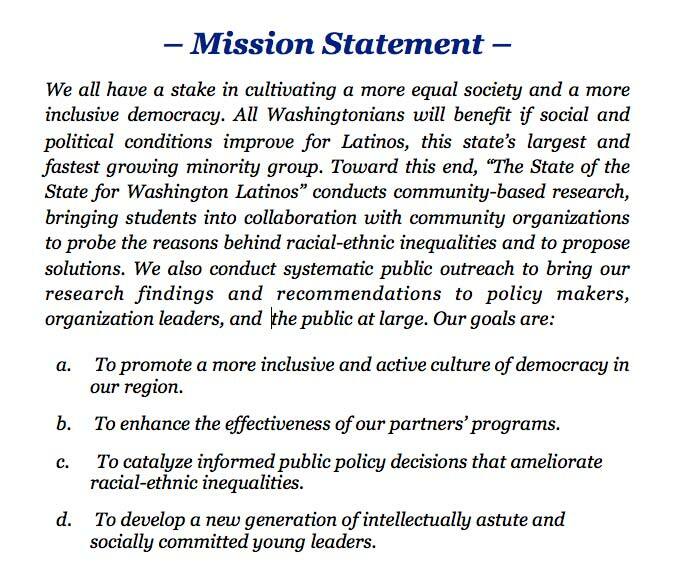 All Washingtonians will benefit if social and political conditions for Latinos improve. the reasons behind racial-ethnic inequalities and the effects of programs intended to diminish them. Students situate their original empirical analyses in critical relation to prior studies. do this in multiple locations, with diverse groups, and in both Spanish and English. • To promote a more inclusive and active culture of democracy in our region. • To enhance the effectiveness of our partners’ programs. • To catalyze informed public policy decisions that ameliorate racial-ethnic inequalities. • To develop a new generation of intellectually astute and socially committed young leaders.